Tides are the most consistent variables in our surfing lives. The Ocean is always either receding or approaching your shoreline. It is a constant reminder of the geometry and power of astronomical forces. Tides erode coastlines, impact marine ecosystems and even facilitated early life leaving the sea. Rising tides can pull swell onto a beach while dropping tides can focus wave energy to a shallow sandbar or reef. Tides are caused by the gravitational dance between the Earth, Moon and Sun. Gravity is a fundamental force that attracts every object to every other object. It’s the force that brought Newton’s apple to the ground and the force that accelerates a bodysurfer down a wave face. The more massive the object, the stronger it’s gravitational pull. The closer two objects are, the stronger the pull of gravity between them. This pull between objects is called a tidal force. The Moon, Earth and Sun are freaking huge. About 36 Moons can fit inside the Earth and 1.3 million Earths fit in the Sun. Although much much less massive than the Sun, the Moon’s gravitation has a stronger impact on Earth because it is much closer. The sun is 93 million miles away from the Earth while the Moon is only 240,000. Much like an apple is pulled to the ground, the Ocean is pulled toward the Moon. Luna’s tidal force tugs on the Earth, pulling the Ocean off some beaches for low tide and onto others for high tide. The force also impacts the Earth’s crust and atmosphere but only fractionally compared to liquid water. Tides are caused by two bulges formed in the Ocean. One from the tidal force toward the Moon and the other on the opposite side of the Earth caused by inertia as our planet spins. This is the same centrifugal force that keeps the water in the bucket when you swing it over your head. The bulges follow the Moon and the spinning Earth around the globe. When a bulge passes your beach, the tide rises. 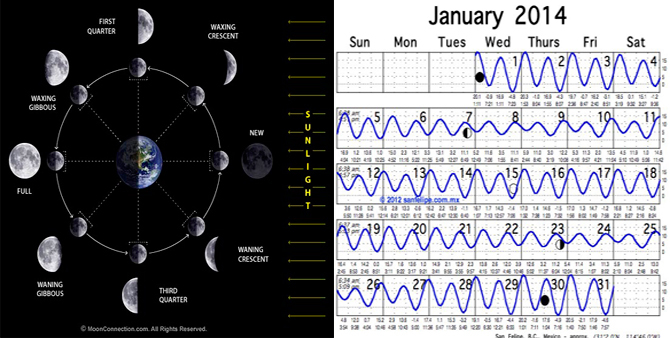 Lunar phases (L) and notice the strong spring tides near Full and New Moon (R). As the Moon orbits the Earth, it “waxes,” growing and showing more of her face each day. After about 14 days the alignment is Sun, Earth, Moon, with the full face of Luna reflecting light. Then Luna wanes- shrinking each day until New Moon again two weeks later. The rest of the tide chart flows up and down between these points with the first and third quarter Moons having the smallest tidal range. These are neap tides. The differences between tides from day to day and month to month is the result of astronomical motions. Luna’s orbit around the Earth forms an oval or ellipse. Sometimes she is closer to Earth than other times. King tides are the highest tides of the year and exist when the Moon is closest to the Earth and in syzygy alignment with the Sun. Ebb is the decreasing tide while flood tide is the increasing. The moment the tide changes is called slack water. There is 6 hours between each high and low. Tomorrow’s high tide will be about an hour later than today’s. Tides vary greatly all across the globe depending on factors like geographic location, local weather/swell and shoreline geology. The East Coast of the US is semi-diurnal. This refers to two highs and two lows each day of roughly the same height. The West Coast is mixed semidiurnal: two highs and two lows each day with different heights. The Gulf of Mexico is diurnal: one high and one low each day. Three billion years ago, the Moon was much closer to the Earth, the tides rose thousands of feet over the land and then back to sea. 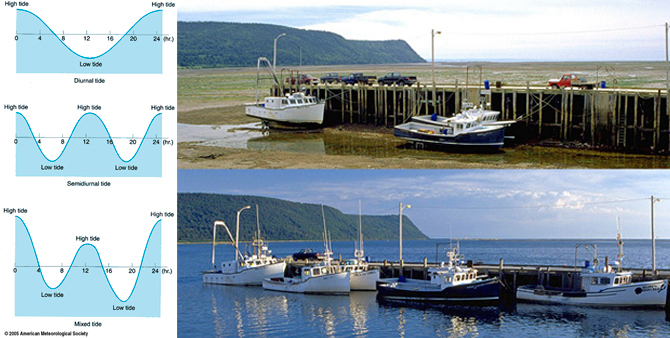 Today, the greatest tidal range exists in the Bay of Fundy, Nova Scotia. Tides are focused in and out of the bay resulting in a 50ft.+ tidal change. The lowest tidal ranges of just a foot occur in the Mediterranean, Baltic and Caribbean Seas. The middle of Ocean basins also experience minimal tidal changes. Hawaii’s tides rarely change more than 2ft. However, California’s tides exhibit much more dynamism. California king tides can approach 8ft. with an accompanying -2ft. low. Right: Bay of Fundy of Nova Scotia: largest tidal range on Earth. Tides impact waves in a variety of ways. Surf spots that prefer certain tides are referred to as tide dependent. Some spots are flat until a tidal push focuses the energy on the beach. Other spots stop breaking when the tide floods because the water becomes too deep for the waves to shoal. As a general rule, incoming, low to high tide is preferable for many surf spots. Low tide can create fast, hollow, plunging waves. High tide often produces slow, mushy, spilling waves. However, many shorebreak womps prefer high tides pushing up the beach. Changing tides can also alter the strength and direction of longshore and rip currents. Death, taxes and tides. The great English poet, Geoffrey Chaucer, wrote “Time and tide wait for no man.” They are predictable and unstoppable. Tides are the only variable in surf forecasting that are concrete and certain. Waveriders can feel the rhythm of the tides. We experience the astronomical forces on a different level than the mathematicians and physicists. This article originally appeared on Swell Lines: The Bodysurfing Magazine. See more of their work by visiting their website, SwellLinesMag.com.